Special Containment Procedures: SCP-XXXX is to be contained in a glass cube of 1 by 1 by 1 meters. SCP-XXXX is not to be removed from its containment chamber unless approved by a Level Two (2) or higher personnel. An electric pulse system (EPS) is to be installed in SCP-XXXX's containment chamber. This device has to be checked every week to prevent system malfunction. The EPS is used to deactivate SCP-XXXX when attempting to breach containment or any other situation where it is preferred to be inactive. In the event of SCP-XXXX breaching containment, Mobile Task Force must use weapons similar to the EPS instead of weapons which use bullet ammunition to prevent damage to the SCP. 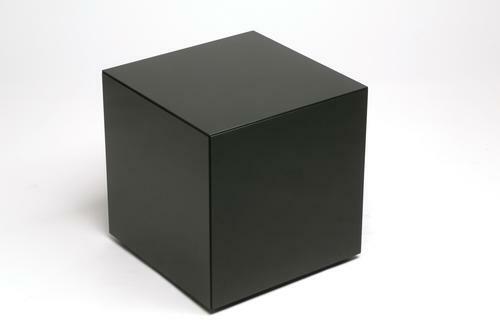 Description: SCP-XXXX appears to be a black cube of an unknown metal. The cube can change size, but will always remain the same mass of five (5) kilogram, as well as keep its color. It has been observed to transform into various metal objects, such as a screwdriver. The objects it transforms into are still functional. SCP-XXXX seems to be non-magnetic. SCP-XXXX is capable of speech and emotions (refer to Addendum B-2). SCP-XXXX was found in a cache composed of a similar material as SCP-XXXX beneath the ground in Sweden. It was discovered on ██/██/2018 when construction workers were working on sewer pipes. [20:32:56] Dr ████ was preparing to go home. [20:33:02] SCP-XXXX became active and transformed into a mannequin. [20:33:06] SCP-XXXX noticed Dr ████. [20:33:08] SCP-XXXX started to talk to Dr ████. Dr ████: (not knowing SCP-XXXX was able to talk) Uh, hello? Dr ████: I am not authorized to tell you. SCP-XXXX: Oh, well could you tell me why I am here? Dr ████: You were brought here. Dr ████: You were causing problems. Some story about you causing equipment to malfunction. SCP-XXXX: What? But, (SCP-XXXX paused) I didn't know I was capable of doing that. [18:33:59] SCP-XXXX started looking at its hands. [20:34:09] SCP-XXXX started showing signs of emotional distress. [20:34:11] Liquid started to appear at SCP-XXXX's eyes. Special Containment Procedures: SCP-XXXX is contained in a metal chamber of 3m x 2m x 2m. The organism only eats orange and red colored vegetables, like tomatoes and carrots. It refuses to eat vegetables with any other color, and any other kind of foods. Description: SCP-XXXX looks like a grey rabbit with a completely white stomach. If you try to harm it in any way, the organism doesnt show any pain and no wound is to be seen. It can survive extreme weathers and temperatures. While researching this SCP, it was found that it was approximately 2600 years old. SCP-XXXX is found and captured in █████████, The Netherlands. It does no harm to humans, but it does to other rabbits. When SCP-XXXX bites any personnel, the subject is reffered to as SCP-XXXX-1. SCP-XXXX-1 feels no pain and no bite marks are seen. SCP-XXXX-1 gets the same powers as SCP-XXXX, meaning it cannot feel pain and no wound can be seen when hurt. The effect remains until SCP-XXXX-1 is out of a 6m range from SCP-XXXX. After 4 hours having this effect, it will become stronger and will heal any wounds that were already on SCP-XXXX-1's body before bitten. 4 hours after that it will even cure any disease, except for [DATA EXPUNGED]. This effect is called "Potestas of Jupiter", Which is the Latin translation of "Power of Jupiter". This name is found on the wall in [DATA EXPUNGED]. Besides the information above, SCP-XXXX will have a normal behavior. Special Containment Procedures: SCP-XXXX is surrounded by 4 meter high walls with spikes on top. Only personnel level 3 or higher are allowed to come here. Description: SCP-XXXX is an appartement inside an appartement building located in █████████, Ukraine. SCP-XXXX has no windows. SCP-XXXX acts like a venusflytrap. It lures living creatures to it. When something enters SCP-XXXX, the door closes and gets locked by itself. After that the victim will start laughing continously until it dies from dehydration or hunger. When the victim has died, SCP-XXXX fills itself with fluoroantimonic acid. The acid then corrodes the victim but for some reason doesnt damage SCP-XXXX. When the victim is corroded SCP-XXXX drains the acid through small holes in the walls. Special Containment Procedures: SCP-XXXX is contained in an SCP website. It needs a computer to survive. The computer should be turned on at least once a day. If the computer is not turned on once a day, SCP-XXXX disables the computer. Description: SCP-XXXX is a computer virus. It is different from other computer virusses. SCP-XXXX can leave the computer and infect humans. SCP-XXXX enters a computer and duplicates in the harddrive. It infects living things by luring them to the computer using a high pitched noise. Humans will try to turn off the sound. When a living creature touches the computer, they will be infected. The infected creature will be referred to as SCP-XXXX-1. SCP-XXXX-1 will turn into a living computer. When a creature is infected, the heart will turn into a motherboard. The brain will turn into a processor. After a few days, SCP-XXXX-1 will have trouble with using its limbs. SCP-XXXX starts duplicating when SCP-XXXX-1 has completely turned into a living computer.